I've made no pains to hide the fact that I'm not a huge fan of the winter. In the summer I think nothing of running to the store at 10pm to buy some milk, but come the darkness of winter and I hunker down in my house, leaving as little as possible and only when necessary. Working from home and living close to my children's school affords me the luxury of not having to drive that much in the winter if I don't want to. So suffice it to say that I'm a bit of a "Winter Recluse". Unfortunately this tendency puts a damper on not only my social life, but my ability to engage in basic human interaction. By the end of the winter I emerge like a bear waking up from hibernation, grouchy and squinting in the sunlight. 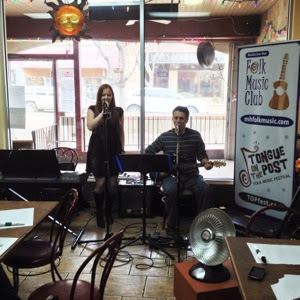 In a move totally unlike myself, I agreed to break my winter isolation when I was approached by Stay in Medicine Hat to cover the annual Tongue on the Post Folk Music Festival. 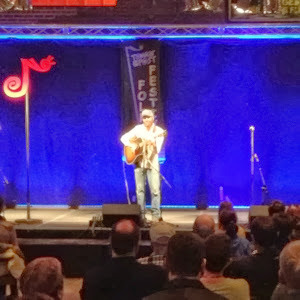 I'm embarrassed to say that although I've lived in Medicine Hat & area for most of my life, I've never before attended this winter folk music festival. The organizers were clever when planning this festival. Rather than just another music festival in an already jam-packed summer festival schedule, they booked it for the darkest depths of winter, when we're all going stir-crazy and have cabin fever; when we're all a little starved for something to look forward to. This week-long festival provides ample opportunity to hear many different acts in a variety of locales. The schedule is such that if you miss an artist at lunch one day, you can catch them at an evening show later in the week. 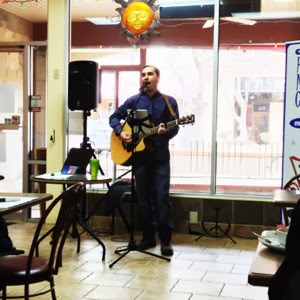 I spent two delicious and entertaining lunches at The Patio Café, enjoying the homegrown talented musicianship of Derek Gavey, and Leaving Aphelion. Friday brings the Singer/Songwriter Night, where you'll hear both amateur and professional musicians ready to bare their souls and offer up their work on the altar of public opinion. Definitely not a venture for the faint-of-heart. I've been considering hiring a singer/band to play a backyard concert at my house this summer and I decided that the Singer/Songwriter Night was the perfect audition for my own personal Lollapalooza, (or Coachella for those of you who weren't teenagers in the late 90's like me). 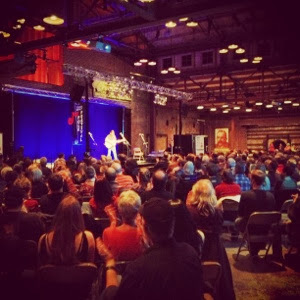 This year's festival main shows and workshops were held at Medalta which was a match made in heaven that showcased not only the musicians, but a fantastic historical site as well. The Saturday night GALA concert featured three different acts, all unique in their styles, sometimes jumping from genre to genre in their own set lists. 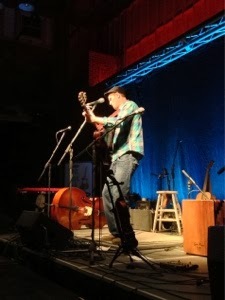 Folk music is funny that way, I can't think of another style of music which can go so many directions. Of particular note was Jesse Dollimont and the Ospreys - another home-grown talent. 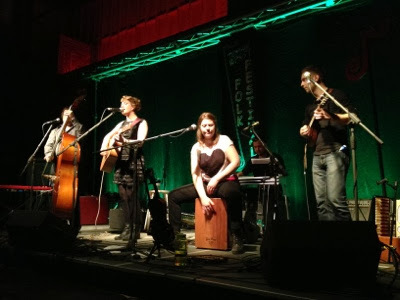 Their skillfully blended harmonies and superb playing of mandolin, bass, violin, steel guitar and guitar made them a delight to listen to. I bought their CD and have listened to it pretty steadily since the folk festival. It was totally worth braving the cold and snow. See you there next year.